bbc.comBritish number one Johanna Konta is aiming to win in the French Open main draw for the first time when Roland Garros starts on Sunday.Konta, who is seeded 22nd, plays Kazakhstan's world number 93 Yulia Putintseva from about 14:00 BST on Sunday.Reigning champion Jelena Ostapenko begins her defence against Ukraine's Kateryna Kozlova last on Court Philippe Chatrier. Men's second seed Alexander Zverev and fourth seed Grigor Dimitrov also play on the opening day. 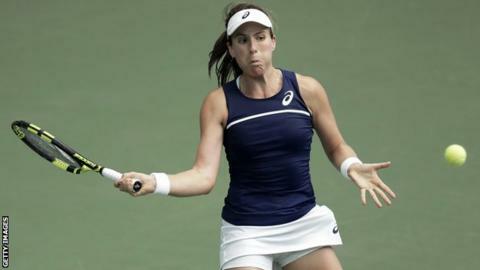 Konta, 27, has slipped down the rankings since her memorable run to the Wimbledon semi-finals last summer, having reached just one quarter-final since.She has lost in the first round on both of her previous appearances in the main draw at Roland Garros, but insists those experiences are not reflective of her ability on clay. "People assume I don't have a great relationship with the French Open because of my results in the past two years," she told the BBC. "However I have experienced success here having qualified for the tournament - I've only qualified for two Slams, at the US Open and the French Open. That is an incredible highlight for me, especially at that point of my career, so I have great feelings of success here. "I feel I'm playing good on the clay right now and I back myself in every match I play so I consider myself a threat. "I back myself on every surface. "Follow Konta's progress against Putintseva on the BBC Sport website, where you can listen to 5 live commentary from Paris and follow live text updates.